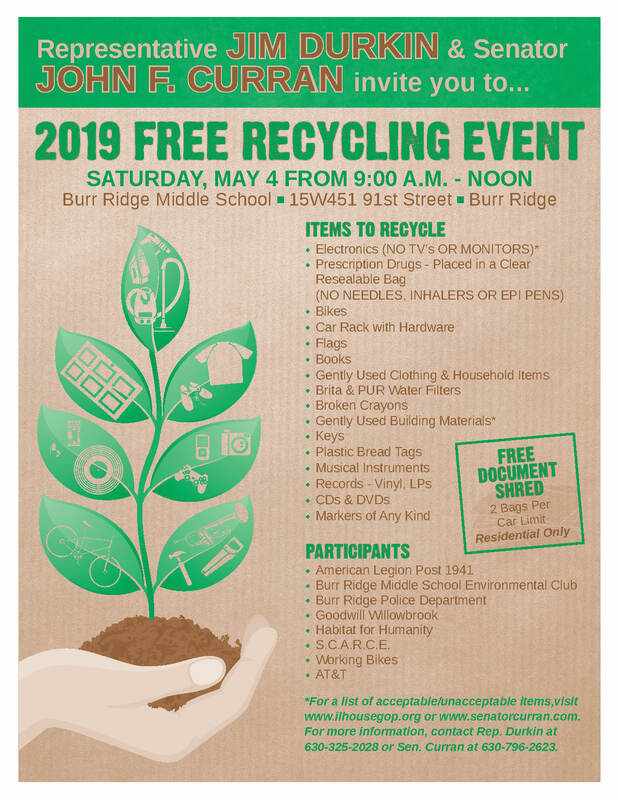 Please join State Representative Jim Durkin and State Senator John Curran for a free Community Recycle Event they are hosting to keep unwanted items out of landfills and to help residents properly dispose unwanted Prescription Drugs. To protect constituents from identity theft, AT&T will also be on hand with a shred truck to destroy residential documents. Please note there is a 2-bag per car limit for shredding. Residents are encouraged to bring unwanted items from the list below to Burr Ridge Middle School, 15W451 91st Street in Burr Ridge, IL on Saturday, May 4, 2019 from 9 a.m. to 12 p.m. Here is a list of items that will be accepted. Flooring: Wood & tile, 3 box min. ; Carpet – new, 100 sq.ft. min. Hardware: Hinges, knobs, nails, nuts, bolts, etc. Contact Rep. Durkin’s office at 630-325-2028 or online for more information.